School programs, community lectures and public events is how we spread the word on a global level. Some of our program topics include: Longevity and the ongoing commitment of any and all pets; Spaying and neutering and the affects of animal over-population; Compassion and kindness, striving to teach and respect all living creatures. 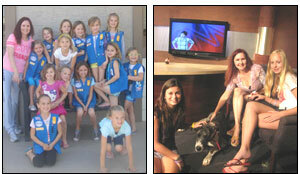 Kelly Perry of Lucky Paws provides an animal welfare class to ages pre-school up to high school. Discussions vary on age appropriate material and understanding and also provides a question and answer session. Times can range from 20 minutes to 1 hour. This can be an ongoing weekly class for Biology, morning announcements or summer school. We have different animals that accompany us to meet students and faculty! Allocated school time is sought after and should be scheduled at least a quarter/semester in advance. Wish List items are often collected by the school class and provided to us that day. Our biggest hope is to inspire and mentor future generations of humanitarians. If you are a teacher, teachers aid, student or equivalent, send us an email to find out about having us come visit your class!